Happy Monday, everyone — hope you all enjoyed the amazingly warm weather yesterday! My car got a much-needed wash from top to bottom, and the house got a huge dose of spring cleaning. As for the house, this is a post I've been meaning to share for a while, but wanted to wait until all of these frames were filled with the right pieces. I'm still thinking about swapping a few out, but I'm really happy with it for now. When we moved in, we really only had two placement options for our TV: the large wall opposite the front door, or above the fireplace. For me, the mantle is a definite no-no unless it's the only spot you have to work with, so we decided to mount it on our large wall. The sheer size of the area forced us to solve for the space, so the TV wouldn't look lost, or force us into getting a bulky entertainment cabinet. 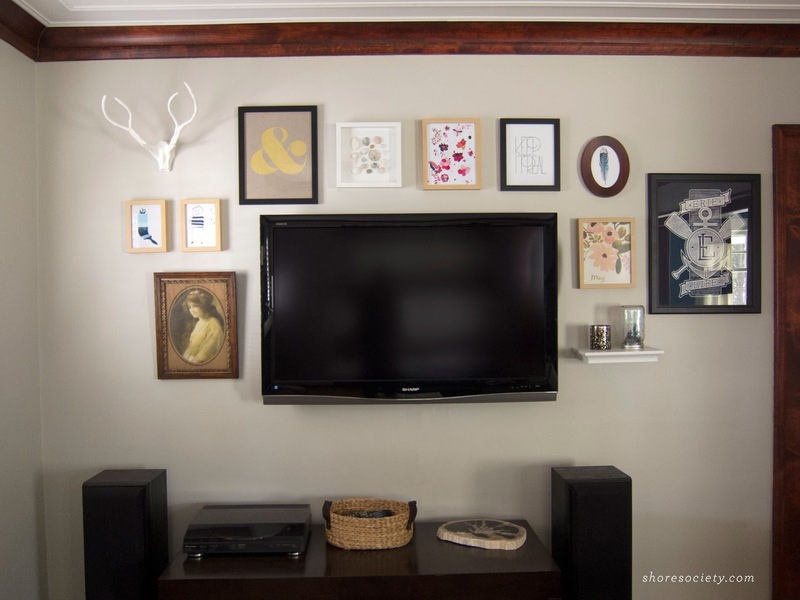 I found a few images online where the TV was 'hidden' among an artfully designed gallery wall, and knew that this would be a perfect way for us to fill the space and display our favorite pieces of art. There are a few different approaches to pulling off this look — you can either use the same color frames or monochromatic artwork to unify the collection, or you can go for a more eclectic mix like I did. This can look a little busy if you're not careful, so you'll just want to keep a good balance of variety in mind. I started by collecting some of the artwork that I knew I would hang, as well as some empty frames to be filled later. 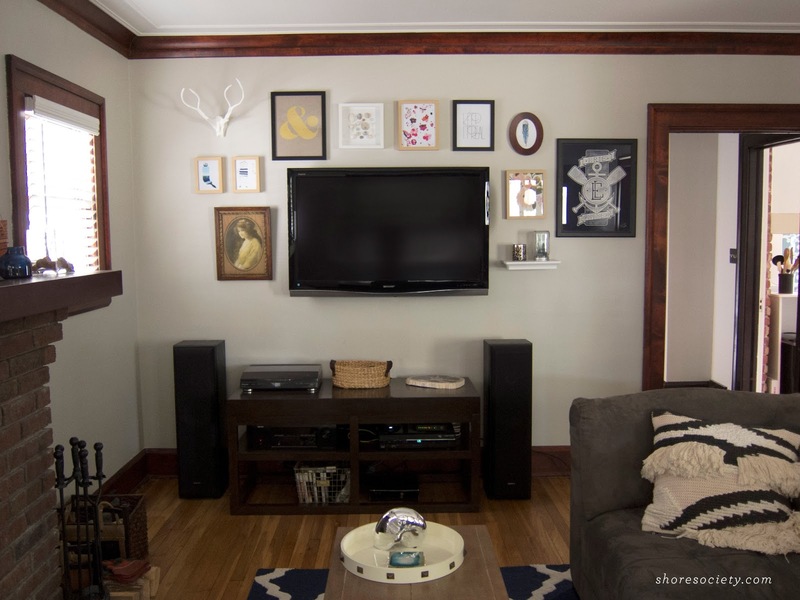 If you have the space, plan your wall layout by placing your artwork on the floor. 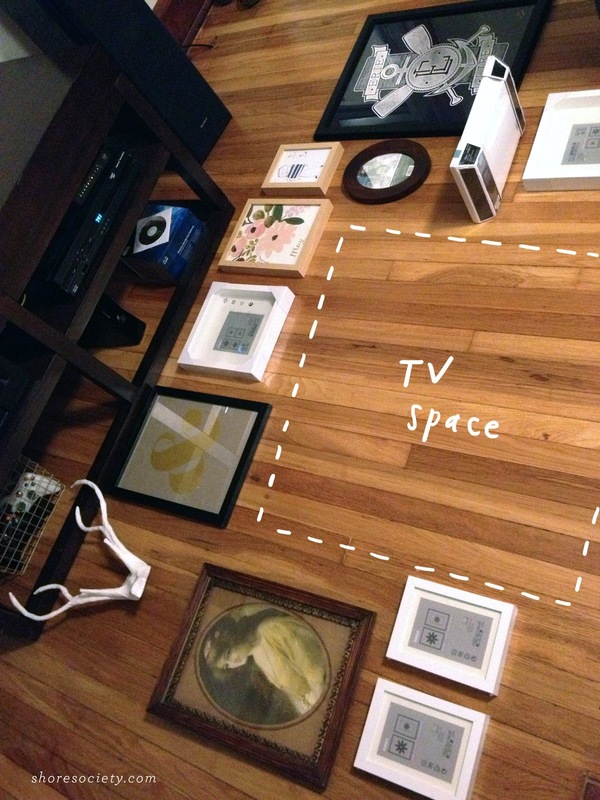 Measure your TV, and use some painter's tape to tape a TV-sized area out on the floor (not pictured, but I did it!) This way, you can move your frames around and experiment with placement. 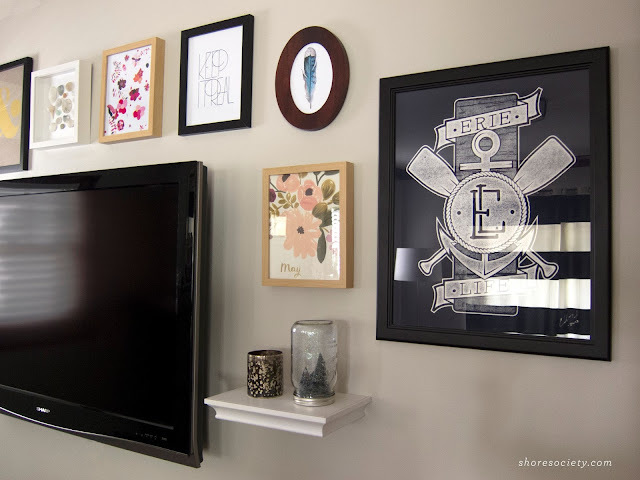 Once you have your frame layout decided, you'll want to start by hanging one picture, and basing the others off of it. You don't have to measure too precisely, because it's better to have the frames be optically balanced (hold them up the wall, and eyeball it). Get the first one right, and the rest will fall into place easily. 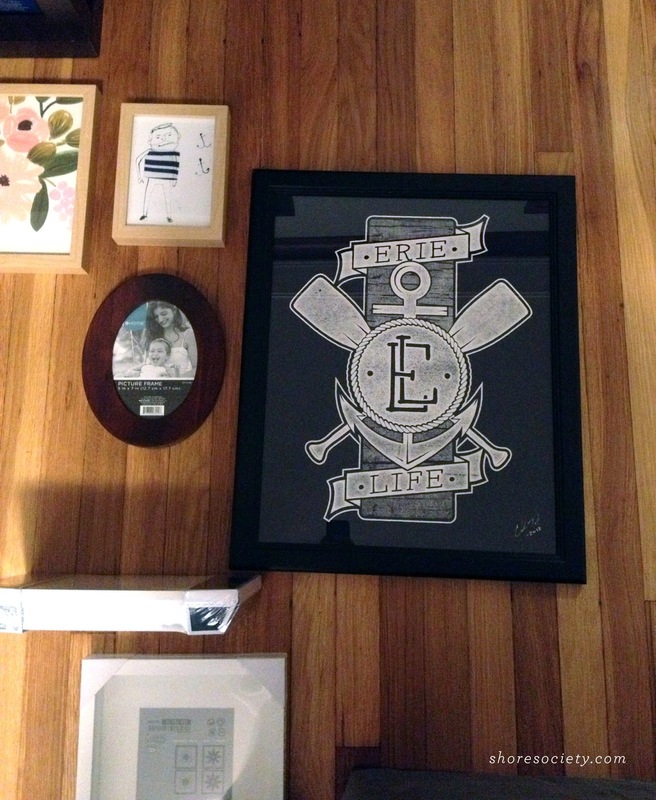 Isn't this "Erie Life"print by Chad Tibbits amazing? I saw it in the WMC Fest gallery show back in June and new we needed it for our house. It's the biggest feature on the wall, besides the TV! I added in a small white floating shelf on the right side of the TV to balance with the white antlers in the top left corner. Adding dimension to the wall breaks up the clusters of frames and gives the wall a more eclectic feel. I've put everything from candles to a small vase of fresh flowers on the shelf, so it's fun to have some flexibility, too. Add texture where possible; an antique portrait adds warmth, while a shadowbox featuring a shell collection feels like a piece from a natural history museum. A metallic gold ampersand on warm kraft paper adds a bold, modern focal point. P.s: doesn't our new ceiling look great? :) You can see the 'before' pictures and process here. We're both really happy with how the wall came out, and it serves as a great conversation starter when guests walk through the front door. It's the perfect focal point, not only visually, but as the entertainment hub of the living room. I'm glad we didn't have to resort to putting the TV over the mantle, so now we can allow the mantle to be the more classic centerpiece that it was meant to be. Thanks! Lots of detail work but so worth it!